The decoration of our house must be creative. We should be more careful in our washroom decoration also. Especially we have to take a lot of care in bathroom decoration. As bathroom will be always wet, so we should choose the flooring tiles which suit the wall tiles of the bathroom. The wet tiles will slip, it is suggested not to choose the smooth and shining tiles should not be chosen for bathroom floor. You should choose the tiles which does not slip when they are wet. The tile color and the bathroom wall color must match. The tiles must get dry soon, such kind of tiles must be chosen. If we stand for more time then more dirt accumulates on the tiles. Granites, slates, sandstones are good for the floor tiles of the bathroom. compare to ceramic tiles, these tiles does not slip. But they soon get breaks. To use them for a long time, we must choose the tiles which do not have or get any scratches on them. Glass tiles are also good. Normally people choose ceramic tiles. but these soon gets stained with dirt. These tiles take more time to get dry. so marble or granite is the best floor tiles to our washroom. Follow these tips and choose the best tiles, so that your floor will be long for your bathroom. People feel that cleaning toilet is a very tough task. These few easy tips to it. If you follow them, then your toilet will shine and smell good. There are many detergents are available in the market to clean the toilets but they spoil the tiles. Among those detergents, some releases poisonous gas while cleaning. when the toilet is not clean then the bacteria will get created and these will cause infection to the people. How to clean toilets naturally? Wear plastic or rubber glouses to your hands. Open the toilet doors and window doors and then clean the toilet. Pumice stone : To remove water and salt stains, rub the toilet by wetting the pumice stone. caustic soda : When toilet pipe gets blocked then clean it by adding caustic soda or sodium hydroxide. Then the water will go easily. while using this chemical we should wear glouses. white vinegar : Vinegar kills the bacteria. So pour vinegar in the toilet. After some time, sprinkle baking soda on the toilet and on toilet brush and then flush. Baking soda: Sprinkle baking soda on the basin, leave it whole night and wash it with water at morning. Lemon juice and borax powder : Make a paste of lemon juice and borax of ratio 1:2. wet the basin and apply this paste to it. Use sponge or Golf while applying. Let it be from 5 to 6 hours. then clean it using water. How much neatly you maintain your house, that much neat you have to maintain your washrooms in your house. Because, bathroom will be wet always and there is a chance of effect of bacteria or insects. So we have to follow few tips for maintaining your bathroom neatly and attractively. Remove the unnecessary things from bathroom shelf. Place only soap, conditioner and the things which you use daily. Always place 2 washed towels on the towel hanger. These towels must be washed frequently. Replace shaving blades and rubber bands frequently. Don't place unnecessary things in the bathroom. Clean the soap boxes regularly or else the soap leftovers will stick to the box and may lead to skin problems to us. Purchase new toilet brush for every 6 months. When a bathroom contains a special place for shower bath then it will be more useful to us. Then our bathroom looks modern. But the place must be big. 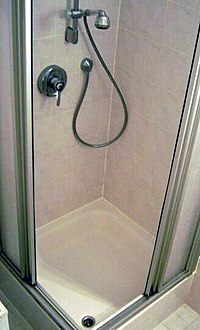 Now a days, bathroom shower ready made enclosures are available in the market. Before placing them in your bathroom judge them using few tips. Before, purchasing the bathroom shower enclosure, first try to know how much space is there in your bathroom. According to the space in the bathroom, you need to purchase the enclosure so that you fix it at a corner of the bathroom. Arrange the shower head in such a way that the water does not come out of the shower encloser. When we are arrange a separate room for a shower in the form of enclosures then the remaining part of the bathroom must not be wet. Set the water that is hot or cold before only. The shower enclosure should have some space for letting air to move so that the wet place in the enclosure gets dry. So instead of doors we can arrange the curtains to the enclosure for the movement of air. The cleanliness of the bathroom shows the status of the family. Most of the people who keep their house neat and clean but get tired when the bathroom turn comes and they postpone of cleaning of it. People maintain bathroom as a dustbin. Due to this, people who come to your house they feel happy by seeing your living room decoration but they feel a bit uneasy by seeing washroom as it is not neat. So if you want such situations should not occur then you need to follow a few tips. Though your bathroom is small or big, it may have tiles or does not have, but it should contain only the things which are used daily. When henna and soap stains occurs on the tiles those must be cleaned by using acid. Don't throw the left over soaps here and there in the bathroom. Collect them in a mud and add water. It will become some liquid soap wash. We can wash our hands with this water. Never throw the sanitary napkins or any napkin like things in the flush as the pipe will get block. Try to clean the bathroom using some detergent everyday. Most of the ladies take a lot of interest on all the room decoration but they leave about the bathrooms. If they show little interest on bathrooms also then our bathroom also will look beautiful and comfortable. Some people arrange bathrooms in big size. some people feel comfortable with small size bathrooms. It is best to arrange white color lights in the small sized bathroom. When your washroom is small then you should arrange less wash basins and flush. In small sized washrooms we should not throw things wherever you want. Because the washroom will look more smaller and congested. The things which you use daily should be kept in a proper manner. therefore, it will be more comfortable for you later. When you arrange a big mirror in the washroom then the washroom looks more spacious. Paint the washroom with light color but avoid using dark colors. Try to hang sceneries and artificial plants in the bathroom. Therefore, the bathroom look more beautiful. When you hang the curtains related to nature then the washrooms look more beautiful. When water is getting leak from the pipe then try to stop it at least temporarily but don't neglect. Because more water will get waste and current bill will increase. While the water is getting leaked and if you are getting irritated with the drops of water sound then place a sponge or gunny bag under the leakage. Then your problem solves. If you want to remove the water drop stains on the floor then first rub the stains with lemon slice and then with salt. Then wash the floor. While taking bath with hot or warm water then the fog sticks to the mirror in the washroom. so if you rub the mirror with a drop of shampoo then the mirror shines. When your house is clean then your mind will be pleasant and happy. In some houses, the first room will be beautiful but remaining rooms will be untidy. The people who visit their house they will praise by seeing the living room but when they see the remaining rooms by mistake, then their opinions will get change. We should clean under the beds, windows and doors regularly. Clean the washrooms regularly. We should be aware that keeping our house clean means protecting our health, happiness and making our mind pleasant. But not for others sake. This is the real fact. Bath gives new energy, interest and activates the people. But when our bathroom is clean and tidy and beautiful then only we can enjoy our bath. A few tips to maintain washroom in such a way to enjoy bathing. Drain : We have to arrange drains properly so that the water from the bathroom go out. while taking hair bath, then don't let the hair go and stop at the outlet of the bathroom as this may block the pipe. Shower bath gives us a great enjoyment to us. while arranging the shower in the washroom we have to take care. Try to use shower enclosure. Am an IT professional, having 2 years of SEO experience. The New World of Advertisement - Game Changes!